Interspecific interactions between parasites and hosts can influence the evolution of behavioural and morphological adaptations of both parasites and their hosts. There is, however, little empirical evidence available regarding the evolution of reproductive traits driven by these interactions. In this paper, we investigated host selection and ovipositor length in nine sympatric marine sculpins that oviposit into tunicates or sponges. Field and genetic studies have revealed host use for eight out of nine species of sculpins investigated here: five species of Pseudoblennius, two species of Furcina and one species of Vellitor. For one species studied (V. minutus), no egg masses could be found. Ovipositor length reflects morphology of host species utilised: six sculpin species had extremely long ovipositors allowing females to attach eggs to the deep atrium of solitary tunicates, whereas the two species that attached their eggs to the small space of atrial siphon of colonial tunicates and the spongocoel of sponges had short ovipositors. Ovipositor length varied between solitary-tunicate spawners and species with longer ovipositors selected larger tunicates. Since the ancestral form is non-parasitic, the ovipositor evolved as an adaptation to utilise sponges and tunicates as hosts. 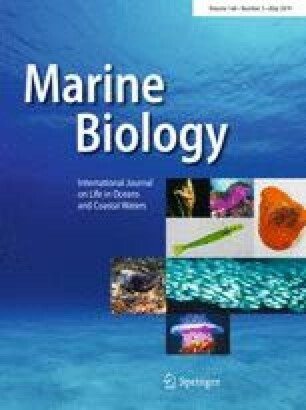 Sculpins found sympatrically may show host specificity to avoid interspecific competition for spawning niches and ovipositors may have evolved depending on the species and size of host invertebrates. The online version of this article ( https://doi.org/10.1007/s00227-019-3506-4) contains supplementary material, which is available to authorized users. We thank Teruaki Nishikawa and Yuji Ise for help with the classification of tunicates and sponges. We are also grateful to Mitsuo Homma (Diving Service F. Wave), Ryo Honma (Sado Diving Centre), Yoshihisa Sato (Senkakuwan Ageshima Aquarium), Akihiro Yamada, Hiromitsu Takashima (Ogi Diving Centre), Tadashi Shoji (Diving Service S. World), Sadogashima SCUBA Diving Association and Kitakoura Recreational Fishing Cooperative for support in the field. We would like to thank Tomonobu Uryu for creating videos for us and Editage (http://www.editage.jp) for English language editing. The anonymous reviewers provided helpful comments on the manuscript. The project was financially supported in part by JSPS KAKENHI Grant Numbers JP24770016 and JP16H04841 to S.A., JP26450259 to Y.K. and JP25304011 to H.M. and by the Sasaki Environment Technology Foundation (H26) to S.A. The research reported in this study was carried out in accordance with Animal Care and Use Committees at Niigata University and Osaka City University. All of the procedures described above meet the ABS/ASAB guidelines for the ethical treatment of animals. Research permission was obtained from Fisheries Cooperative Association of Sado, Japan.